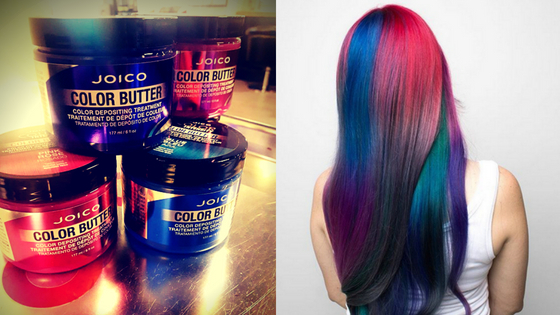 Hands up how many of you have really, REALLY wanted brightly coloured hair, but decided against it? Loads of maintenance, right? The effort just doesn’t seem worth it when the colours fade so fast. Well, here’s a whole lot of bright, buttery goodness to change your mind (or make your day, if you’re already part of the colour-parade!). Joico’s Colour Intensity Colour Butter is a nourishing, colour depositing treatment that is totally free from peroxide, ammonia, MEA and PPD. So no funny stuff. If you’re keen on an intensely bright ol’ barnet, apply the butter to your hair when it’s dry. And, if you’re feeling a softer pastel vibe, make sure your hair is wet before applying. You can even combine a couple of Intense Colour Butters for an even bigger statement. Go wild, express yourself. It’s so easy! Just an FYI for the darker follicled of our friends, you’re going to have to lighten up those locks for best results, as the Colour Butter is made specifically for blondes and pre-lightened hair. We can, of course, apply the colour treatment for you no problem, however, you can ALSO buy pots of the good stuff in-store and do it yourself at home. Why not pop down to us and take a look at the colours we have available? We can give you all sorts of further info and advice on how to make your hair pop this summer!